I have to admit, the prologue of this book gave me pause. The hero, Damien, is described as having bright green eyes and a lightening-shaped streak of gray in his hair, making him oddly reminiscent of Harry Potter (though Master of Illusions predates Harry Potter and the Sorceror’s Stone in the USA). Moveover, I certainly did not expect to find a paranormal regency romance among a collection of books from the late nineties. I had the impression that fad was more recent . 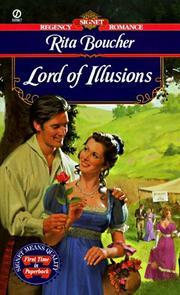 . .
Fortunately, Rita Boucher makes Lord of Illusions a compelling and enjoyable romance. The protagonists have both been deeply injured in various ways. Rowan was crippled in her ability to use magic by her elderly, deceased husband’s greedy desire to keep her under his thumb so that he could use her ability to read minds for his political benefit. The way that he “prostituted” her talents (and assaulted her body) has left her feeling defiled and resentful of men. As a side note, it is refreshing to see a period piece that portrays a loving single mother who raised her child far away from her abusive husband. Although we see little of their interactions, so many period books are constrained by convention to give us virginal heroines with little experience of the world. Rowan is quite different. If anything, she has seen far too much of it (rather like the stereotypical regency rake–though without a stable of gigolos, for she prefers to express her misandry by avoiding men). Now to our hero: Damien–accustomed to being a powerful mage–is now unable to use his magic and left with little but his wits and the illusionist’s tricks that he learned from his brother-in-law. Worse, he is weighed down by his failure to live up to his responsibilities to his family. Ever since his betrothal to a young Welsh girl was broken off so she could marry a French mage (because of her own desire for profit, he assumes), Damien has remained single. He has failed to produce an heir–a serious problem for the magical Wodesby family. But how can he find a wife now? People “of the Blood” are rare, and he is forbidden to wed Outsiders. Most are promised from the cradle, anyway, and the few that remain unwed are more interested in his name, power, and position. Besides, what would a potential bride think when she discovered he’d become, shall we say, magically impotent? He would be little more than a burdon and an embarrassment should his condition become public. While Damien waits and hopes that his powers return, he is glad to serve his country again. Then, he begins to realize that finding the evidence of the diplomatic “leak” will condemn Sir Hector Southwood, a sweet widower with two children and a fascination with magic tricks and the occult, to horrible disgrace. Then, there is the mysterious governess to contend with: a widow who hides her vibrant beauty behind false spectacles and dowdy clothing. The pair find themselves inexplicably drawn to each other–yet both the disguised protagonists believe they are separated by an impossible gulf. Neither can marry an Outsider, and neither suspects the true “Blood” identity or political machinations of the other. Throw in a band of gypsies, various animal familiars, nasty villains, and a really evil book of spells, and you end up with a very entertaining book. Rowan and Damien are a compelling couple. They have a strong attraction for each other from early on, and their encounters are often cryptic, caustic, and sensual at the same time. The barriers to their relationship are high, and the political intrigue makes their situation even more difficult. Their scars from past wounds–invisible and deeply private–required them to build immense walls which must crumble in order that they may heal. In terms of Explicitness, this book presents a problem. The interactions between Damien and Rowan are–for the most part–not explicit. They are fairly chaste and sweet. If you are able to handle the more brutal aspects of Lord of Illusions, I recommend Boucher’s book. It is surprisingly good. I hope that I find more regency-paranormal novels, which I find more satisfying that the contemporary urban-paranormal genre.